What do you get when you combine the best high school performers with the best young and old performers in Brewster? You get the best Brewster’s Got Talent in the show’s five-year run. The show benefits the Brewster Education Foundation that provides college scholarships and grants to teachers and staff. The Brewster High School Performing Arts Center hosted the show on Friday, January 25, 2019 that included twenty live acts that included singers, musicians, dancers, twirlers and a gymnast/ The judges (Bill Flash, Carolyn Martin and Vinny Larusso may had the toughest job evening trying to determine the youth, high school, adult and overall winners. The adult winner was four-time show performer and Brewster High School Teacher, Anthony Loiacono. Loiacono sang a classic Anthony Newley tune that mesmerized the audience. The high school division saw a tie for first place prize between former overall winner, Annie Sullivan and singer Justin Rodriguez. Annie sang and played the guitar to her own song “Perfect”. Annie is a junior at Brewster High School and Justin is a freshman. The youngest performer of the evening stole the show and was the youth and overall winner. Emiko Noelle Dunn amazed the crowd and judges with her strong performance of “Wizard and I” from Wicked. The nine-year old fourth grader from CV Starr broke down in tears when she heard she was the winner and said it was the happiest day of her life. Wells Middle School Musical Director, Johna Barrow led a chorus of staff and students in a stirring rendition of “We are the World”. The group performed before the first intermission. 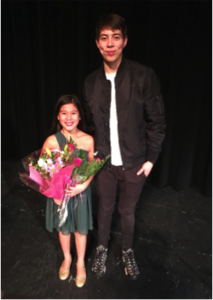 Other performances that deserve a shout out include HH Wells seventh grader, Ivelisse Arocho who danced to a Michael Jackson medley, the dance and singing duo of Tessa Boissonnault and Gianina Santos and the amazing twirler and Brewster High School sophomore, Ashley Sheil. “This is the best kept secret in Brewster and I can’t believe that the ticket prices are only $15,” said Bill Flash. 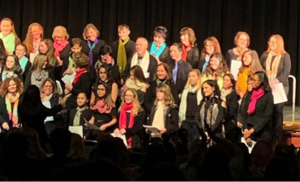 “The talent level exceeded our expectations and we are hoping that the Wells Middle School Chorus inspires our high school staff to be involved next year,” said Brewster’s Got Talent Chairman, Joe Cavanagh. “We would like to publicly thank Ann Marie Chalmers and our stage crew for the flawless job they do to make the evening run so smoothly”, Cavanagh added.